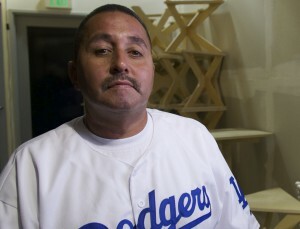 Joseph Barela used to think that as long as he was working and had a new pair of Nikes on his feet that was proof he wasn’t a drug addict. But one day he found himself high on cocaine in the company of his 10-year-old daughter. “I was looking at my daughter and felt so bad, my throat hurt,” he recalled. His problems included his own criminal acts and convictions: breaking and entering a department store in 1989, stealing tires in 1993, receiving stolen property and resisting arrest in 1999. He served eight years in state prison. Once out, Joseph found that his record made it difficult to find work. Sometimes he would leave the space on job applications about past felonies blank in order to explain himself in the interview. But the background checks caught up to him. He grew frustrated at being told “We’ll call you,” when he knew his phone wouldn’t ring. He got his chance when he reluctantly agreed to go with coworkers to a Prop. 47 legal clinic, hosted by Californians for Safety and Justice, on May 2 in Culver City. He thought “it was going to be a waste of my time,” but after meeting with a free clinic attorney, he learned that two, possibly three, of his nonviolent felonies could be reduced to misdemeanors. Joseph is hopeful that the new law will help put his past behind him. He’s been off parole for seven years and, since August, working at Fred Brown Recovery Services in San Pedro, doing housekeeping and janitorial work. He hopes to pursue a career as a therapist. Watch: How Prop 47 Has Impacted California!